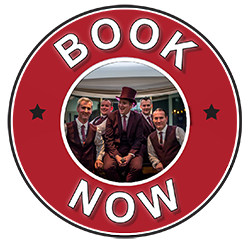 Truly Diverse are an established wedding band based in the south west of Ireland. The Band performs Pop, Rock, Country and Old Time in their own unique and exciting way. The Band consists of three of The O’Connor Brothers, Brendan, Patrick & Anthony, no strangers to the Irish Music scene, Kieran Healy, who brings his Rock & pop sounds to the band and Andrew Doyle, one of Ireland's finest entertainers.Together they form Truly Diverse, a band described as energetic, professional and most of all talented. Be it a Waltz, an 80’s classic or the latest chart toppers, this band covers them all. Living up to their name and reputation. See what our fans have to say. Even Better Than We Could Have Wished For! To Truly Diverse, Thank you so much for an incredible night at Blairscove House last September 8th. Choosing the right band for our wedding was one of the most important things for us. We saw you play two years prior to our wedding, at a friends wedding - Noreen & Owen in Muckross Park Hotel. We weren’t engaged then, but we both said if we were ever to get married we would make sure Truly Diverse were playing for the big day. We were so lucky that you had availability on our date and they didn’t disappoint. The floor was hopping all night and the highlight for our guests was the Siege of Ennis on the tiny dance floor! Tables, chairs, and everything that could be moved, was moved! On our way to the airport for our honeymoon we got a thank you message along with a selfie of us and Truly Diverse - so thoughtful! Fantastic energy, great music and really, really nice guys who will make sure your wedding is everything you ever wanted. Please find a few pictures attached for you guys to use for your own advertising if you’d like. As a bridal makeup artist, I will be recommending you to all my brides. Thank you and hope to see you play again soon, Annette & Brendan Foley. Kieran Healy is the charismatic lead singer and electric guitarist of the band and his high energy performances are a huge part of Truly Diverse’s exciting shows. The heart of any good band is its drummer and Truly Diverse is very lucky to have an experienced, musical and powerful drummer in Patrick O’Connor. Patrick is also a talented bodhrán player, percussionist and backing vocalist who always adds to the energy and texture of Truly Diverse. Truly Diverse’s Musical Director Brendan O’Connor has been playing music since he was 6 years old. Primarily the keyboard player with Truly Diverse he has spent his life playing, writing, recording and producing music. Anthony O’Connor is one of the most electric and dynamic performers in the country. Although also playing the mandolin, his main instrument is the fiddle. Anthony can move between Irish, pop and rock easily with the talent he possesses and his infectious charm will win over all ages and all audiences. Andrew Doyle is the man of many musical talents. Having been playing music from a very young age Andrew is no stranger to the stage.